Nose: Fragrances of lemon and citrus. Palate: The dominance of the Fins Bois cru is definitely part of the tasting experience. Enjoy notes dry almond, hints of spices, and honey tones. Eye: A golden, honey-ish hue. 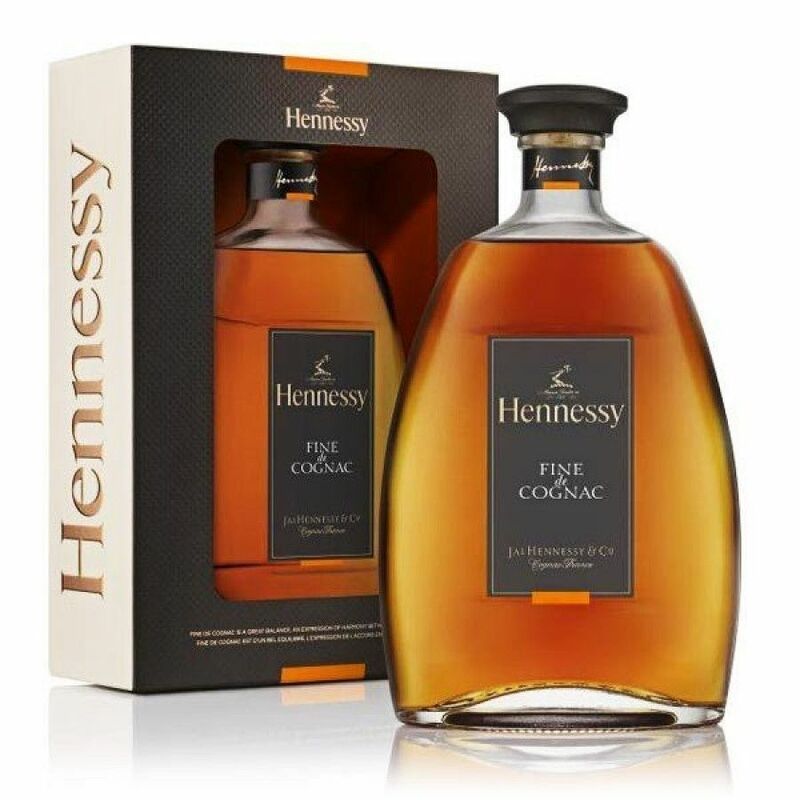 Hennessy Fine de Cognac is a youngish concoction of eaux-de-vie presented in a stunning decanter and presentation sleeve. It is a VSOP Cognac, also known as a ‘Very Special Old Pale’ quality, which means that it is a truly versatile bottle to own. Aged in Charentais oak barrels, this youthful blend is considered to result in a more delicate and well rounded Cognac. Hennessy, the masters at producing Cognac, have aimed this at the younger generation—those who perhaps like to be experimental when drinking Cognac. This VSOP represents excellent value for money. 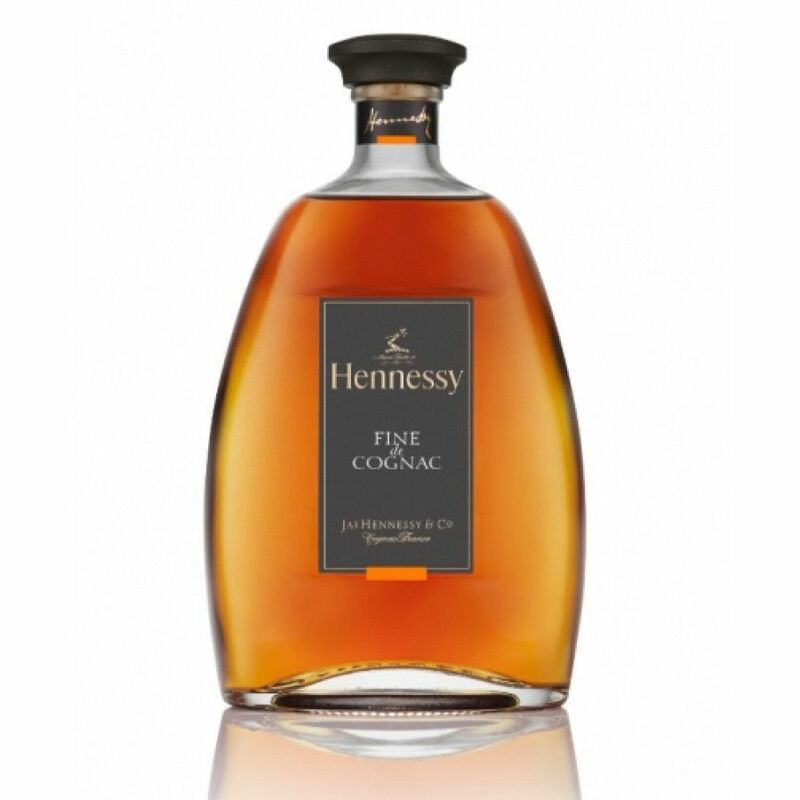 The Hennessy Fine de Cognac 70cl truly is a good staple to include in your cabinet. It can be enjoyed in many ways, including as a digestif, or perhaps as that extra-special ingredient in your favorite cocktail. Expert mixologists have gone as far as to mix the Fine de Cognac to create a cocktail fusion with a selection of delicate teas. Or why not try it over ice for a different taste experience? This Fine de Cognac provides an excellent alternative to the Hennessy Pure White if you’re looking for something a little different. A truly unique blend, the Fine de Cognac achieves an aromatic harmony from over 60 different eaux-de-vie in one bottle alone. Dipping its toes into four cru zones in the Cognac region, it is a result of several eaux-de-vie maturing together from the Borderies, Fins Bois, Petite Champagne and Grande Champagne terroirs of the Cognac region. Such a diverse and wide-spanning growth area means that it has a variety of notes from the mixture of younger and older eaux-de-vie coming together. Alongside the Fine de Cognac original edition created in 2002, there is the Hennessy 'The Fine Mix’ Limited Edition Fine de Cognac. The origins of Hennessy Jas (et Cie) date back to 1765 when the company was first established by Irishman Richard Hennessy. This brand, which is one of the world’s most noted Cognac producers, has continued to grow exponentially in terms of quality and reputation. It began as an eaux-de-vie trading business, and from early on showed clear signs that it was going to become the most successful worldwide exporter of Cognac. It forms part of the Louis Vuitton Moet Hennessy Group today and continues to push the boundaries in terms of contemporary innovation with its refreshing collaborations with various markets. Most notable are its collaborations with the US hip hop music scene. The estate and headquarters themselves are based in the homonymous town of Cognac in Charente, France. Very intense aroma of flowers. The taste is very unique compared to other types of Hennessy that I've tasted. The aftertaste is not harsh but it has a kick to it unlike any other Hennessy that I've tasted. I must that the overall experience was very satisfying and well worth the money spent. Definitely worth it! I love the aftertaste most of all. I love the Pure White Hennessy but find it difficult to get here in the USA. Someone recommended that I try the Hennessy Fine de Cognac instead... Though not a replacement for the pure white, this is an excellent tasting choice. I have introduced it to friends who have delighted in the gifts that I have provided. I am so glad that it was recommended and I highly recommend it to all of you. This bottle isn't available in the US as far as I know. They used to have a different version or blend, I prefer the new blend. Also, I am not sure if it's a VSOP I think it's almost an XO (6-10 years minimum). Very smooth palate, very fruity and not too sweet. Love it! The "quality rare" was superb. The new formula is very disappointing.Unfortunately the original blend cannot be found. True, Rob. Actually the word "quality rare" vanished from the label of the Fine De Cognac by Hennessy. That would mean that this might no longer be a VSOP but technically a VS? Still, it's quite a round cognac I'd say.. so Hennessy would never print VS on the label as people would think it's close to their VS cognac. This is an exceptional cognac aged in matured old barrels, limiting the oak influences, resulting in the purest, most fruity and floral cognac. The maturing and blending method explains the pale color, since they have not used any caramel to darken color like in a lot of cognacs. Its also one of the best for using in luxury cognac cocktails. Definately less agressive/sharp taste than "regular" VSOP (Privilege). Smoother taste in the beginning, and younger, fruity. It turns into something darker after few seconds, hints of wood tastes &amp; maybe chocolate. i had it in small botle in Switzerland, it's actually very smooth compared to Courvosier VSOP. Quite interesting product. Its colour is super transparent, very light colour.. which made me thought this would be very young and rather aggressive. Here comes the thing: It's not agressive, still fruity, but quite round; almost too round. Fine de Cognac by Hennessy goes well with dessert by the way. Hm. they introduced this Hennessy bottle in Germany some time ago. it's not a very impressive drink I'd say.. and I wonder why it's that expensive? what is it exactly, a vsop? or is it a VS cognac (2 years old)...?